Wader Quest: Just to keep you on your toes. Just to keep you on your toes. 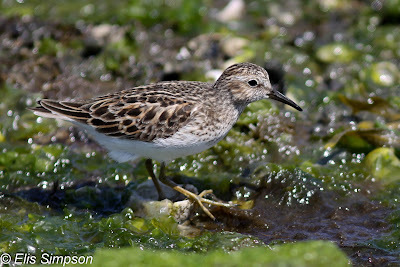 Most people who care about such things will probably be aware that the toes of a Long-toed Stint are slightly longer than the tarsus, whereas in the case of Least Sandpiper, which it greatly resembles otherwise, they are not, the tarsus and toes are about the same length. Most field observers will agree that this feature is about as much use as a chocolate teapot. 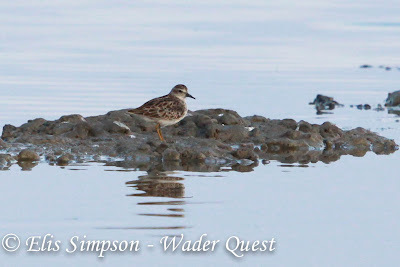 The toes are rarely visible, these birds being denizens of wet muddy places by and large, and they will not often stop still long enough for a reasonable appraisal of the relative lengths of these features. In addition, it is only people searching for rarities that will want or need to determine which is which as they do not normally occur together. But, the presence or lack of a hind toe can, in two cases clinch an identification. I was recently contacted by an old friend in Brazil who is still at the steep learning curve stage of birding, asking for help with the identification of some shorebirds she had photographed on the beach. She thought the birds were Semipalmated Sandpipers. With a quick glance I was able to tell her that they were in fact Sanderling, and how was I so sure? They were running around on the sand and it was clear to see that they had no hind toe. Sanderling, is the only Calidrid with no hind toe. In a similar situation back in the bad old days in Brazil, a friend confidently and proudly displayed the first ever photograph of a Grey (or Black-bellied) Plover for the municipality in which we resided. It was a lovely shot of an American Golden Plover. Now these birds are surprisingly easy to confuse, and their relative wing lengths need to be checked etc., but once again the presence or otherwise of a hind toe will clinch it. Does it have a vestigial hind toe? Yes? Then it is Grey Plover, No? Then it is another Pluvialis plover, as in the case stated. Grey Plover is the only Pluvialis plover with a short, but distinct hind toe. We don't have any shots of live birds to illustrate this, so here are specimens from the Zoological Museum of São Paulo University. Once again I do accept that good views are required to see this feature, but then if you haven't had good views you can't safely identify it with any confidence anyway.